For the first time since doubts were voiced about U.S. Sen. Roland Burris' honesty in the face of questions regarding his contact with former-Gov. Rod Blagojevich, Burris has acknowledged he sought to raise campaign funds for the then-governor at the request of the Blago’s brother. The timing couldn't have been worse. His efforts, he admitted in comments in Peoria Monday night, were at the same time he was making a pitch to be appointed to the Senate seat previously held by President Barack Obama. Burris' comments were the first time he has publicly said he was actively trying to raise money for Blagojevich, the Chicago Tribune reported. Tuesday night, an editorial posted on the Tribune's Web site called for Burris to quit. Also Tuesday, the U.S. Senate Ethics Committee officially opened an inquiry into allegations Burris committed perjury in his testimony to the Illinois House Impeachment Committee, the Sun-Times reported. The Illinois House speaker referred several documents associated with Burris' testimony to Sangamon County State's Attorney John Schmidt. Those documents are available here on the Illinois General Assembly Web site. The senator held a brief news conference Tuesday afternoon, where he "welcomed the opportunity to provide a full and complete account" of his actions to Schmidt. Burris said his office already contacted Schmidt to say the senator will answer any and all questions. "I have nothing to hide," Burris said. However, others in Illinois government aren't convinced. "This is a particularly frustrating revelation," Attorney General Lisa Madigan said of Burris' recent disclosure that he had contact with five Blagojevich insiders. Madigan on Monday urged a deeper investigation into Burris' comments, without specifically calling for a look at possible perjury charges. "I encourage the Sangamon County state's attorney to take a closer look at this in the interest of truth, integrity and transparency," she said. "The faith of the people of this state is already so shaken," State Sen. Matt Murphy (R) said. "To sit there and have to watch somebody they think lied to them to get a Senate seat, for a whole year to be a senator is a little more than most people are willing to take." Cook County Clerk David Orr (D) wrote an open letter to Burris, calling for his resignation. Late Tuesday, Cook County Commissioner Mike Quigley, who is running for Congress in the 5th district of Illinois, also called for Burris' resignation, and for a special election to be held to replace him. 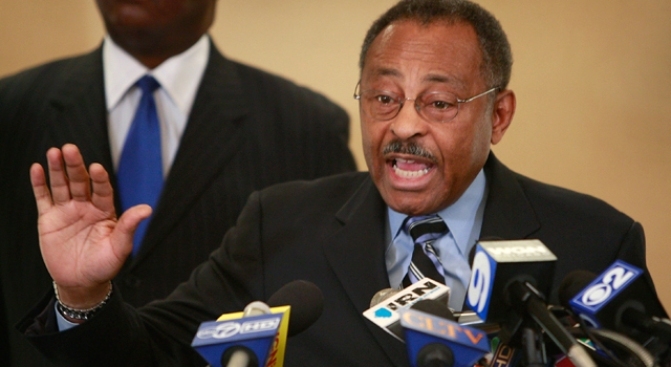 "Roland Burris’ failure to be honest and upfront with the people of Illinois should disqualify him from service in the United States Senate," Quigley said in a statement. "He should resign immediately." Previously, the Tribune said, Burris has left the impression that he always balked at the issue of raising money for the governor because of his interest in the Senate appointment.